The most recent issue of Game Informer contains "loose talk" that Rockstar Games is readying a new Grand Theft Auto, a fully-fledged follow up to GTA IV for the holidays. Not so, say Rockstar reps.
We checked in with the Rockstar folks this week to check out the first downloadable episode, The Lost and Damned, which is due to hit the Xbox 360 next month. 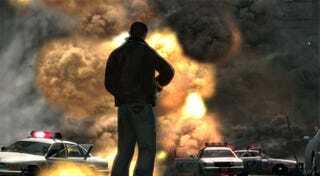 A second episode for Grand Theft Auto IV owners is planned to arrive before October 31, 2009, according to parent company Take-Two Interactive, But there is "no truth" to reports that a wholly new retail game, one on par with the scope of Grand Theft Auto: San Andreas, will arrive before the holidays. And as for the chances of the next Grand Theft Auto game taking place in Tokyo, as speculated by Game Informer's regular rumor column? Consider that little more than a wild guess. Further requests for clarification on the subject went unanswered. So, don't be surprised if the first two downloadable episodes already confirmed for Grand Theft Auto IV are just two of many. Rockstar vice president Dan Houser recently said to USA Today "We feel like we've only scratched the surface in terms of the depth and detail" of Liberty City. Rockstar's VP of product development, Jeronimo Barrera, has called the episodes an "experiment." If successful, it could mean an extended stay in Liberty City before finding a new home for the series. Check back with us next week when we reveal more about the first downloadable episode.